A hermit crab (Paguroidea sp.) with an anemone that substitutes for a shell. Image courtesy of the NOAA Office of Ocean Exploration and Research, Gulf of Mexico 2017. Download larger version (jpg, 1.0 MB). 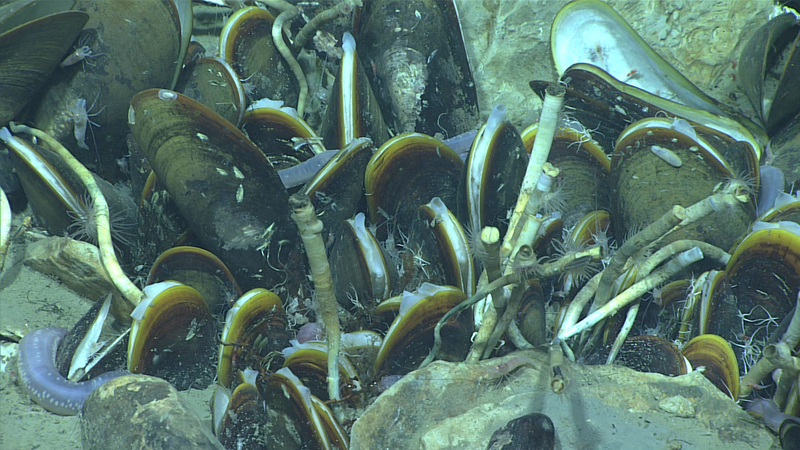 The chemosynthetic community found at the second bubble target included Lamellibrachia tubeworms, Bathymodiolus mussels, Chiridota holothurians, Alvinocaris shrimp, anemones, and ophiuroids. Image courtesy of the NOAA Office of Ocean Exploration and Research, Gulf of Mexico 2017. Download larger version (jpg, 1.1 MB). 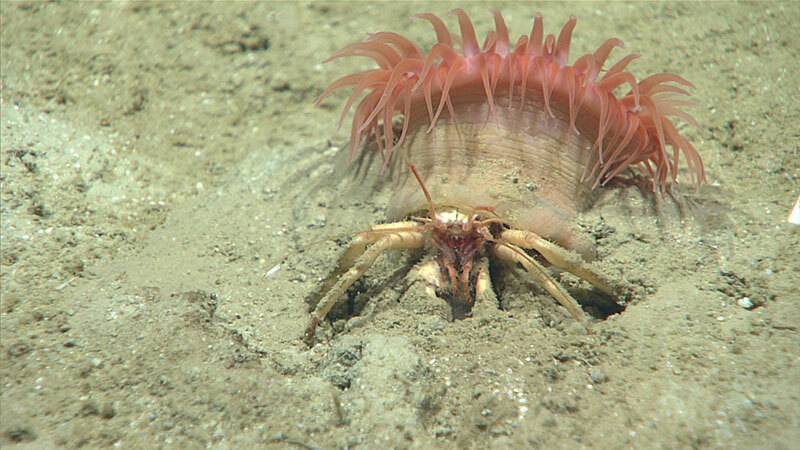 The ophidiid Penopus microphthalmus imaged at a depth of 2,152 meters (1.34 miles). Image courtesy of the NOAA Office of Ocean Exploration and Research, Gulf of Mexico 2017. Download larger version (jpg, 687 KB). During Dive 08 of the expedition, we encountered many of these bizarre-looking sea cucumbers from the genus Chiridota. While these sea cucumbers are often found at hydrothermal vents and cold seeps, very little is known about them and whether or not they are indeed chemosynthetic. 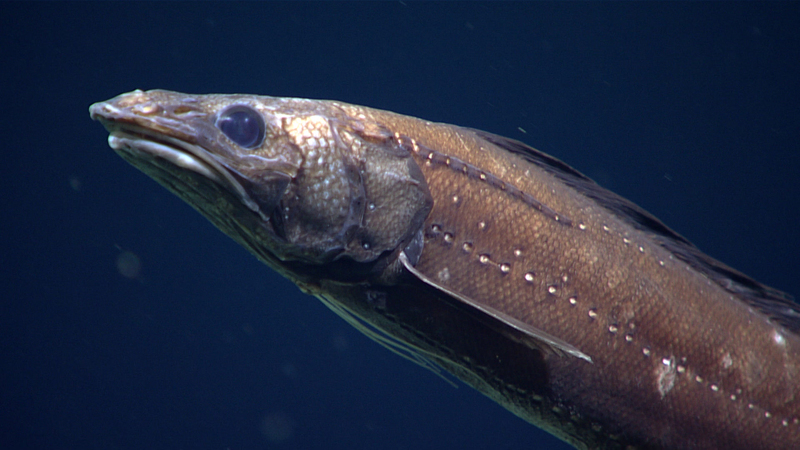 Video courtesy of the NOAA Office of Ocean Exploration and Research, Gulf of Mexico 2017. Download larger version (mp4, 34.8 MB). Today’s dive was located in a geologically active area, on a seismic anomaly identified by the Bureau of Ocean Energy Management (BOEM). The dive started on a sedimented slope at 2,160 meters (1.34 miles) depth, with a high diversity of fishes as well as numerous invertebrates, including shrimp, a hermit crab, and brisingid sea stars. Here, we observed a small area of reduced blackened sediment with bacterial mats and chemosynthetic tubeworms and mussels (both dead and alive). As the dive progressed, it became apparent that the feature originally targeted for exploration was covered in a thick layer of sediment and so was unlikely to host the expected coral communities. As a result, the team instead searched for the sources of two bubble plumes detected the previous night during multibeam surveys by NOAA Ship Okeanos Explorer. The first bubble plume could not be located, but tubeworms and bacterial mats were observed at the second bubble target. We also observed numerous burrowing echinoids (Spatangoida) at this reduced area, as well as some small carbonate outcrops that hosted anemones, corallimorphs, and cup corals. Other notable observations included large numbers of sargassum clumps that had drifted down from the sea surface, a small carnivorous sponge (Cladorhizidae sp. ), and several pieces of marine debris.